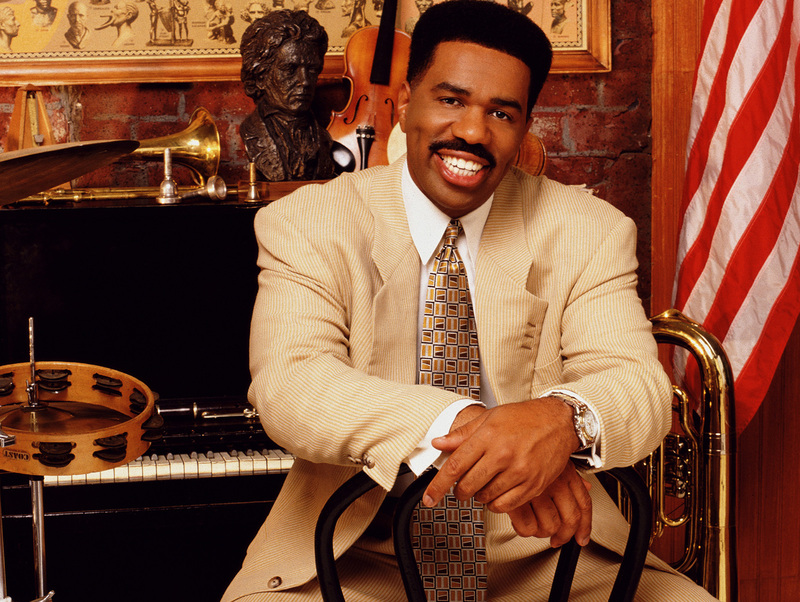 Steve Harvey was almost 40 when he scored his big break on The Steve Harvey Show in 1996. In the years since he’s become one of the biggest stars in show business, with success in live performance, film, television, radio, and even books. But his road to the top was twisty, a fact Harvey himself believes is vital to his longevity. “You have to fail in order to win,” he said in 2012. That’s also the story of The Steve Harvey Show: an R&B singer takes a job as a high school music teacher when his performing career comes to an unceremonious end. He’s bitter at first, but Steve Hightower soon embraces his new role at Chicago’s Booker T. Washington High School. Although the series has an unmistakably ‘90s vibe, Harvey’s portrayal of a teacher who is a father figure to his students will remind you of many classic films and sitcoms. Think Welcome Back Kotter, only funkier. You may know Harvey best as the host of Family Feud, the talent competition Little Big Shots, or his daytime talk show. But without the success of The Steve Harvey Show, those shows might never have happened. The “Steve Harvey” brand was really launched by this sitcom. In Steve Hightower, you’ll see the beginnings of Harvey’s real-life persona as a life coach who dispenses tough-love advice with a dash of humor. We’re proud to welcome The Steve Harvey Show to the getTV lineup - two back-to-back episodes weeknights at 11p ET and another two weekday mornings at 8a ET. Whether you watched it in its original run or are just discovering it today, you’ll find lots to love in this contemporary classic! 1. Steve’s first name isn’t Steve. 2. Steve grew up on a farm. 3. Steve didn’t start performing until he was 27. In 1985, 27-year-old Steve performed stand-up for the first time as part of an amateur night competition at a Cleveland nightclub. He won — and immediately caught the performing bug. Harvey quit his job as an insurance salesman and began doing comedy for $25 per-night. 4. Steve was once homeless. Comedians are notoriously broke, particularly when they’re starting out, and Harvey was no exception. He lived gig-to-gig in his early days in stand-up, until he hit a bump in the road. “One or two gigs fell through, and suddenly I was homeless," he told People Magazine in 2013. With nowhere else to turn, he started living in his car: a 1976 Ford Tempo with an ice chest in the backseat. Harvey would bathe in hotel bathrooms and swimming pool showers between bookings. “A week is really the maximum you can do that,” said Harvey, who lived this way from age 30 until 33. 5. Steve almost missed his breakthrough because he was broke. After 8 years as a struggling comic, Harvey was offered national TV exposure on Showtime At The Apollo in 1993. Only problem: the shoot was in New York City in four days and Harvey was in Florida — with just $35 to his name. “I started crying by the side of the road,” he said in 2018. “I finally get my shot to be on TV and I can’t even get there.” Harvey was able to book two stand-up gigs in Florida that weekend, earning just enough to cover airfare to New York. That appearance led to a new job: as host of Showtime At The Apollo. 6. Steve's first sitcom was a Top 20 hit that was cancelled. 7. The Steve Harvey Show almost didn’t happen. When Me And The Boys was cancelled, Harvey and his producers approached writer/producer Winifred Hervey (Benson, The Cosby Show, The Fresh Prince) to develop a new series, but she was reticent. “I didn’t really feel like (Steve) was quite my cup of tea,” Hervey told the TV Academy in 2013. “But when I sat down with him, I sort of got him, and that’s when I came up with the concept.” Hervey partnered with executive producer Stan Lathan, a groundbreaking African-American director who got his start on Sanford And Son in 1974. Lathan directed all 122 episodes of The Steve Harvey Show. 8. The Original Kings of Comedy grew out of The Steve Harvey Show. After a season on Steve Harvey, Steve and Cedric The Entertainer joined Bernie Mac (and later, D. L. Hughley) for The Original Kings Of Comedy. The two-year stand-up tour became the top-grossing comedy tour in American history, out-earning even the Backstreet Boys arena tour in 1999. A Spike Lee-directed concert film followed in 2000, along with a Billboard-charting, Grammy-nominated soundtrack album. 9. The Steve Harvey Show was never cancelled. After headlining five successful seasons on The Steve Harvey Show, Harvey was ready to move on and pursue new challenges. At the request of The WB Network, he agreed to return for a shortened final season of 13 episodes. The last season of The Steve Harvey Show ended up scoring higher ratings than the previous two, a rarity for a long-running series. 10. Steve is a relationship guru — with a dating website! Harvey has become a sort of relationship guru, dispensing advice on his talk show and even launching his own on-line dating website Delightful with the people behind Match.com! Steve is also the author of Act Like A Lady, Think Like A Man (2009), which was adapted into the feature film Think Like A Man (2012) featuring Harvey in a cameo. His other self-help books include Straight Talk, No Chaser (2010), Act Like A Success, Think Like A Success (2014) and Jump: Take The Leap Of Faith To Achieve Your Life Of Abundance (2016). Two episodes of The Steve Harvey Show air weeknights at 11p ET and another two episodes can be seen weekday mornings at 8a ET. For more, visit the getTV schedule.